There are many ways to study the paranormal events that relate to the survival of human personality after the detachment of the physical body. There are those who try to investigate them driven by motivations in which the contents of the messages are surely more important than anything else, as is the case with people who look for a contact with a loved one in another dimension. Others are conscious of the enormous importance of what is at stake and they set for themselves the goal to understand the phenomena in their multiple expressions. Thus they try to characterize all the elements that contribute to a greater meaning and validity of the results of practical experimentation. Those who followed my work throughout the years know well the trend that I have always set for my research. Every day that goes by I get more convinced that I have taken the constructive path – to be able to ascertain meaning and credibility to the facts, you need objective data. Therefore I consider it indispensable that the phenomena of which we have testimony be investigated to the limits of the possibilities available, using the methods and means that science has determined and recognizes as adequate for the research. On account of this it should be the task of the researchers to document all those events which can be labelled as anomalies under the laws of Physics. Only by acting this way can there be hope to successfully move the cultural environment that is in a position to determine a possible overhaul of the paradigms which are nowadays considered unchangeable by science. This a very slow process full of ups and downs which however contains in itself all the characteristics for new advances of knowledge and cultural maturity. It is in this scope and with this purpose that I am about to establish a connection of the results obtained by the digital electro acoustic measurements done by Daniele Gullà on some samples of «psychophonic voices», of «paranormal telephonic voices» and «direct voices» obtained by mediumistic channels. To understand and value the reach of the observations made, it is necessary to furnish some basic information about the human voice and its production organs. The single acoustic elements of a voice, whose temporal succession constitutes a pronounced word, are called «phonemes». Each phoneme is thoroughly separable from the other ones and presents its own peculiarities, which can be found instrumentally. The words are no more than an assemblage of vocal and consonantal sounds produced in temporal succession. The vocal sounds are generated by the vibrations of the vocal cords activated by the pressure of the air expelled by the lungs. The number of vibrations produced in the unit of time constitutes the «fundamental frequency» of a voice and the vibrations of the vocal cords determine it; this parameter characterizes a voice from the electro acoustic perspective. If the air that crosses the vocal cords does not succeed to make them vibrate, no vocal sounds are produced, but just noise; at the listening this type of voice will sound aphonic, whispered. The sound as it is produced by the vocal cords gives rise to other acoustical phenomena, by means of the vocal tract. 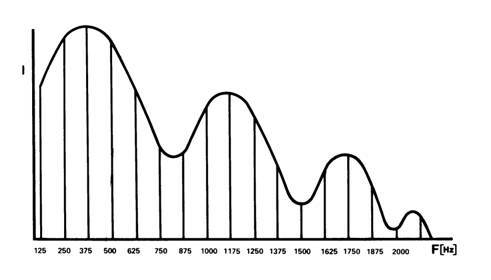 Particularly if the relative volume varies, for instance moving the tongue or modifying the opening of the mouth, it is possible to modify the sound emitted according to the variation of the volume of the above mentioned «cavities of resonance». The vowels are complex harmonic sounds constituted by a fundamental frequency and by a series of frequencies multiple of it, called harmonics. The vibrations of the vocal cords are not audible as they are produced; before reaching the outside of the lips they undergo a series of noticeable changes caused by the effect of resonance. This is the result of the particular configuration of the vocal tract which by its dimensions and shape is different for each person. Consequently the resulting sound is a complex sound, constituted by a fundamental frequency and by some groups of harmonic frequencies, reinforced in the sound intensity, called the «formants». On Fig. 1 we can see the representation of the theoretical structure of a larynx sound of an adult produced at the level of the vocal cords. This is a theoretical representation because it implies that the vocal cords are isolated of all the other speech organs. The graphic displays in ordinate the sound intensity «I» and in abscissa the frequency «F» expressed in vibrations per second (Hertz). The fundamental frequency (125 Hz) and the successive harmonics that are always integral multiples of the fundamental frequency are represented. As easily verifiable, considering the laryngeal sound itself, as produced by the vocal cords, the intensity of the harmonics is progressive and regularly decreasing, to the point that it fits inside a triangle. This basic acoustical structure becomes remarkably modified across the vocal tract. The latter is not regular but it is deformed by the expansion and the contraction resulting from the anatomical features of each individual and the reciprocal interaction that the various articulation organs may take turn by turn in relation to the articulation points. This produces a noticeable change in the timbre of the laryngeal sound because each enlargement of the vocal tract means a resonance cavity. This produces an increase of the sound intensity in the laryngeal harmonics of equal frequency to the one of the resonance. In other words, the sound that comes out of the lips has a characteristic timbre for each person, in relation to the shapes and different dimensions of the resonance cavities of each individual. A subsequent change determined by the articulation activity will occur thus allowing the distinction of the different phonemes and particularly the vocalized ones. Fig. 2 displays of the acoustical structure of a vowel sound pronounced by an adult male, after passing the resonance cavities. The upper curve of the intensity of the harmonics is no longer rectilinear, as in the case of the isolated laryngeal sound, but it is sinuous. Each curve represents an increase in the sound intensity of a group of harmonics due to the effect of a resonance cavity, and constitutes a formant. Therefore, one can appreciate the great importance of the timbre structure. 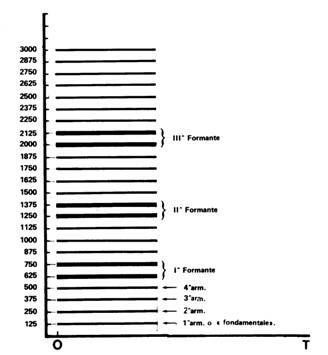 The vowels in particular differentiate from each other by the frequency of the first and the second formants (F 1 and F 2). The frequency of the second formant is indeed different for each vowel while the frequency of the first formant is in many cases common to two vowels as it happens with the vowel couples I-U and E-O. Fig. 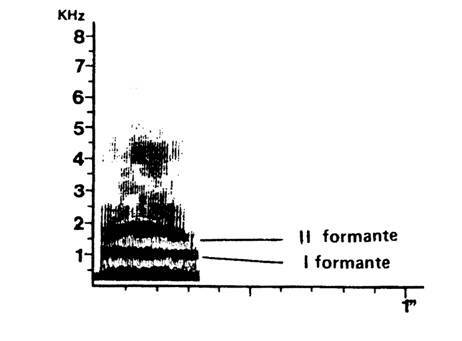 3 displays the distribution of the frequencies of the first and the second formants of the five vowels (referring to the Italian language). A sonogram represents the synthesis of the information hereby mentioned. It is a three-dimensional graphic. On the vertical axis (or ordinate) the values of the frequency in Hz are displayed and on the horizontal axis (or the abscissa) the duration of the acoustic event, while on the third axis, orthogonal to the two preceding ones, the sound intensity is displayed. Figure 4 displays the diagram of the sonogram of the vowel “A” pronounced by an adult male. 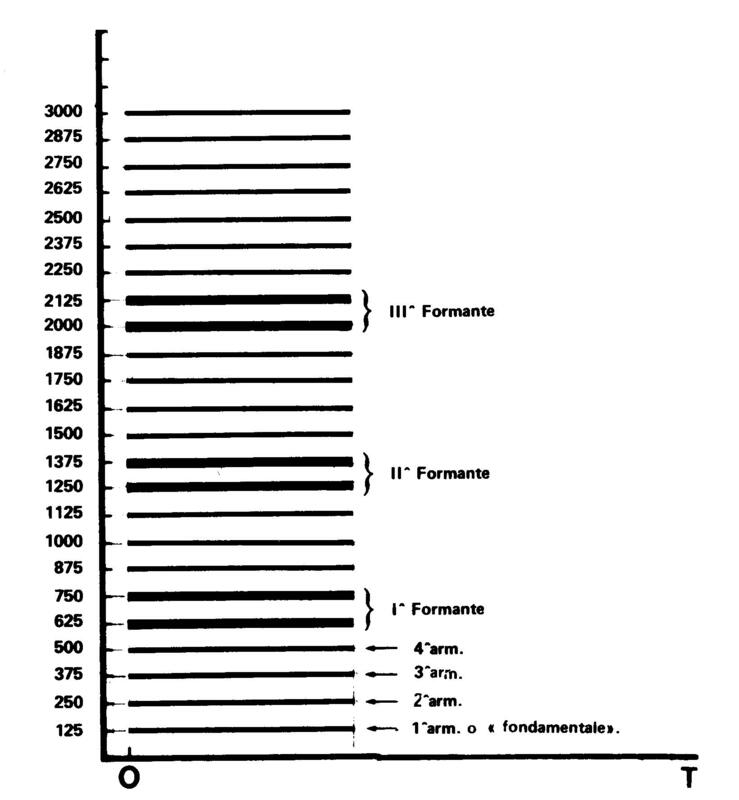 The darkest lines indicate the increase of the sound intensity of the formants. Fig. 5 displays the same sonogram of the previous figure, as it actually is. One can differentiate the fundamental frequency, the first and the second formants. The vertical lines represent the vibrations of the vocal cords. The sonogram obtained by analogue systems (type voiceprint) have limitations due mainly to the subjectivity of the expert’s evaluation. This means that sonograms of a person pronouncing the same word with different tones can show differences of the same nature of those displayed by the sonograms of different people pronouncing the same word. On account of these limitations voice recognition has been aleatory until the coming of the computer. The development of computerised systems has allowed for the use of more sophisticated means in voice recognition and the programmes available today grant the opportunity to process an enormous amount of data in very short times. Conversion of the analogue signal (voice recorded through a microphone or directly from the radio) into a digital signal. Processing the digital signal by reducing the background noise (if it exists). Applying the proper algorithm (included in the software) to obtain the relevant conclusions. To understand in greater detail the means and procedures utilised as well as the possibilities offered by the digital systems in this investigation, we will go back to Daniele Gullà’s report. However I consider it important to make some remarks on the results obtained and to single out the anomalies that characterise the paranormality of the voices analysed. N.2 psychophonic voices obtained during regular microphone recording. N.3 voices obtained through the radio in the Centre of Grosseto belonging, as per their own affirmation, to Friederich Juergenson, Chiara Lenzi and Guglielmo Marconi and subsequently compared with other samples of the same people while alive, pronouncing the same words. N.1 paranormal voice declaring to belong to Konstantin Raudive received through the special devices of the couple Jules and Maggy Harsch-Fischbach of Luxembourg. The message of which the sample was extracted (the words “Konstantin Raudive”) was pronounced in German. N.2 telephonic voices, obtained during paranormal telephone calls, affirming to be of Konstantin Raudive, received at different occasions by Friedrich Malkhoff in Germany and Mark Macy in the USA. The messages of which the samples were taken were spoken in German and English, respectively. The three paranormal voices were then compared to Raudive’s voice while alive pronouncing the same words “Konstantin Raudive”. N.1 masculine “direct voice” (of unknown entity) speaking in Italian during a session through the mediumship of Demofilo Fidani. N.1 feminine “direct voice” (entity Mariol) manifesting in Italian through the mediumship of Urbino Fontanelli. N.2 “direct voices” one masculine (entity William Crookes) and one feminine (entity Ellen Terry) manifesting in English through the mediumship of Leslie Flint. The objective was to check for the presence of anomalies previously found in the psychophonic voices obtained by Renato Orso and analysed in 1985 by the Electro Acoustics Department of the Institute «Galileo Ferraris» of Turin. As well as to direct the investigation by means of modern computerised analysis to other voices obtained through various methodologies and mediumship. Since we had at our disposal recordings of the voices of the same people while alive we thought that it would be interesting to compare them to their paranormal voices, in order to verify their degree of similarity from the strictly electro acoustical point of view. Presence of the formants F1, F2, F3 (which implies the presence of a speech organ lower than the larynx). 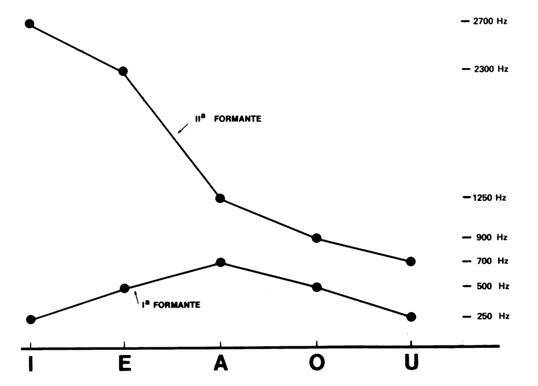 Configuration of the fundamental frequency F0 and of the formants F1, F2, F3 to check the acoustical structure of the voice and the presence of the vibrations of the vocal cords. The bands of the frequencies involved to verify the possibility of association of the acoustic events analysed with the bands pertaining to a human voice. Indicators of correlation between paranormal voices and the human voice as well as their possible similarity. Based upon the results obtained, to determine the presence of anomalies. Two voices were examined whose characteristics confirm the results obtained at the Galileo Ferraris in 1985. The absence of the fundamental frequency within the band of frequencies that characterize the human voice. On the other hand the presence of anomalous peaks that noticeably move away from the normal values was also found. The formants that can be examined seem to be structured by a thickening of the background noise without the vibrations of the vocal cords. The word «the radio» pronounced by Jürgenson during one of his lectures and the same word pronounced in a message obtained via radio by Marcello Bacci at Grosseto were compared. The fundamental frequency found for the vowel «a» of the article «la» and for the vowel «o» of the word «radio» presents isolated peaks whose duration does not correspond to the real pronunciation of the vowels. It is also anomalous that in the vowel «a» of the word «radio» the fundamental is totally absent while it is not in the «a» of the article «la». This situation could also be found in other voices examined. In Jürgenson’s normal voice pronouncing the same words, the diagram is continuous that is without interruption. It is obvious how the two layouts are structured differently. The formants that correspond to the above mentioned vowels seem also to be produced by a thickening of the noise. The graphic lines of autocorrelation indicate how the acoustic event analysed has the characteristics of a human voice (the software of the computer can discriminate a human voice from a noise following pre-established criteria experimentally proven). In addition one notices the strong similarity of the layouts of auto correlation of the normal and the paranormal voices. The word «Chiara» pronounced by Chiara Lenzi when she was alive (recorded on tape by her father Giuseppe via telephone) and the same word recorded in a contact at Grosseto were compared. Among four samples of paranormal voices of Chiara it was chosen the clearest one from the acoustical viewpoint. The subjective evaluation regarding the greatest clarity and similarity was confirmed by instrumental measurements. The presence of the fundamental frequency and the three first formants with the vibrations of the vocal cords can be observed. The graphic shows how the fundamental frequency of the diphthong «ia» has a shorter length than the one of a normal voice. The movement of the formants shows again in this case a strong similarity between normal and paranormal voices confirmed by the autocorrelation graphics. The word analysed «Marconi» was extracted from an old recording of his voice and contrasted with the same word contained in a communication received at Grosseto. A discontinuous fundamental frequency with a presence of isolated peaks was again observed. 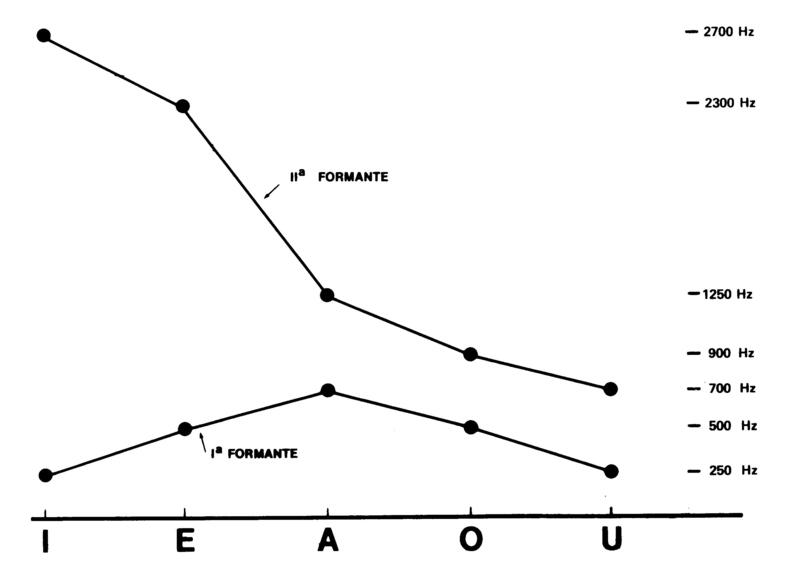 The formants that correspond to the vowels «a» and «o» show also in this case the vibrations of the vocal cords. The formant configurations and the autocorrelation diagram allow us to classify this voice as slightly similar. The first of the three samples analysed, although not exactly telephonic, was received by the couple Harsch-Fischbach in 1988 during the first audio and video contact transmitted through the devices display called GA1 and ESB for the audio and an old out of use black and white TV set for the video. Through a listening appreciation (therefore a subjective one) the quality of the acoustic sample seems exceptional for its similarity to Raudive’s voice while alive. Therefore I included it in the analysis comparing it with the paranormal telephone voices of the second and third samples. Clarity wise the second sample is also remarkable while the third one presents some characteristics of a verbal scansion with an impulsive movement which make the listening slightly difficult. The second and third acoustical samples were extracted from paranormal telephone calls received in Germany (by Friedrich Malkhoff) and in the USA (by Mark Macy). Raudive’s voice while alive has been extracted from a record which was included in his book «Voci dall’aldilà» published in Italy by Tedeschi publisher. The instrumental analysis shows in all the three voices examined (pronouncing the same words «Konstantin Raudive») a structure of common characteristics that show a thickening of noise in the area of the formants, without vibration of the vocal cords. In the first two voices the fundamental frequency is present while it is practically absent in the third one. Instrumentally it was verified how only the second voice (received in German by Friedrich Malkhoff) presents a certain similarity to Raudive’s voice while alive, although the values of the frequency bands relating to F0, F1, F2 and F3 are slightly different from the ones of the voice while alive. The configuration of the fundamental frequency F0 is however very similar to the one of the voice while alive, while such configuration is clearly different in the first and third voices. Also the graphics of autocorrelation show configurations typical of a human voice in the first and second samples, while in the third one there is an anomalous configuration. The voice examined belongs to an unknown Entity, masculine, of the timbric type and has some features of the aphonic type (whispered). The fundamental frequency has an almost regular configuration with near to average values pertaining to the human masculine voice. It presents areas of the formants corresponding to the vowel sounds, that are constituted by a thickening of noise without vibrations of the vocal cords. The graphic of autocorrelation presents a periodicity of signal typical of a voice and yet showing a movement not completely regular. A sample of direct, feminine, timbric voice belonging to the Entity «Mariol» was analysed. The voice is preceded by an initial accord lasting 6 seconds, based upon the pronunciation of the vowel «U» on the intonation of which the whole spoken sentence is structured. In this case the presence of the fragmented fundamental frequency with transient peaks was again observed. The areas of the formants are very irregular and they do not show vibrations of the vocal cords. On the other hand one can verify the existence of a light background vibration which if it was to be considered a laryngeal vibration would be too high to belong to a feminine voice. Finally one has to say that the characteristics of the voice of the medium in a vigil state are instrumentally very different if compared to the characteristics of the direct voices produced through his mediumship. This sample was recorded on July 4, 1965 and it contains a feminine, timbric voice declaring to be Ellen Terry, a famous English actress who died in 1926 at the age of 78. The direct voice was obtained 39 years after her death. In contrast to the preceding direct voices this one has all the characteristics of a human, feminine voice. The fundamental frequency is present and its band values correspond to the typical values of the female voice. The areas of the formants are clearly defined and the vibrations of the vocal cords can be precisely singled out. Also the graphics of autocorrelation confirm the human characteristics of the sample analysed. This sample was recorded in 1962 and it contains a masculine voice, declaring to be Sir William Crookes, the famous English physicist, who invented the cathode ray tube. He studied the mediumship of Florence Cook thoroughly. The sample analysed belongs to a long message received 43 years after his death. Again in this case the electro acoustic characteristics of the voice are extraordinarily similar to the ones of a masculine human voice. The fundamental frequency and the formants with the vibrations of the vocal cords are clearly visible. The autocorrelation layouts confirm the human characteristics of the voice examined. The conclusions of this investigation should be considered provisional since the scope of the analysis was confined to a limited repository of samples. However this does not prevent us from extrapolating considerations based upon the results obtained. In the psychophonic voices obtained by those who fit within the average of people who do not show specific mediumship faculties, the acoustic structure of the voice seems incomplete, lacking some peculiarities that characterize a voice from an electro acoustical perspective. This circumstance certifies for their originality and paranormality. In the observations made it was remarked how the areas of the formants are structured with a «paranormal artifice», through the thickening of the background noise. It is important to clarify that the presence of the formants is strictly indispensable to ascribe to a word precise acoustic characteristics that allow for the carrying of information. The absence of the fundamental frequency, even if it is an interesting example of an anomalous behaviour, does not prevent the carrying of the information. From the energetic point of view the structuring of the formants only, requires less energy expenditure from the communicator; adding to this we could speculate that there is a clear intention to convey information using the most economical methods in energetic terms. In the voices obtained by Marcello Bacci at Grosseto, there are frequent isolated peaks in the configuration of the fundamental frequency. This allows me to consider the specific dynamics of his voices. As I could observe in several occasions they have an impulsive character as if they were the result of energy packages. This circumstance can allow for the presence of a fundamental of a normal frequency when the vowel is expressed in a normal time length. But the behaviour of the same vowel is distinct if the time is, so to say «compressed» or «contracted». In this case the original frequency suffers an increase proportional to the sudden temporal contraction. 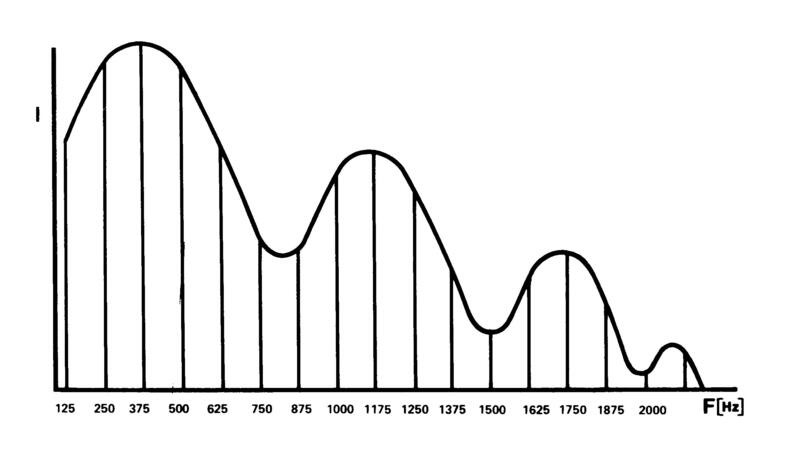 Very illustrating of this behaviour are the graphics of the movement of the fundamental frequency where a series of peaks corresponding to the vowels appear, whose values largely surpass the normal expected values. The voice of Konstantin Raudive obtained in Luxembourg by the couple Harsch-Fischbach shows how a subjective listening appreciation does not comply with the real electro acoustical quality of a voice. I considered then that the message of which the sample analysed was extracted, was of an exceptional quality for the extraordinary similarity of the paranormal voice to Raudive’s voice while alive. But the instrumental analysis showed that from an acoustical viewpoint the voice cannot be considered as such. Also the results of the analysis of the direct voice of Demofilo Fidani could allow for the presumption of an anomalous structure of the fundamental frequency as it was the case of the considerations made on Bacci’s voice. It is however necessary to consider that these remarks imply an obvious physical contradiction because in normal terms it is impossible to have a fundamental frequency without vibrations of the vocal cords. This fact could justify the frequent anomalous behaviour of the fundamental frequency, specially when it presents transient anomalous peaks. The electro acoustic characteristics of the direct voice of Urbino Fontanelli are also atypical since it articulates without formants and with a fundamental frequency of impulsive, fragmented character. This could be in agreement with the remarks already made about the direct voice of Demofilo Fidani and those of Marcello Bacci. Amazing are the conclusions obtained after the analysis of the direct voices of the English medium Leslie Flint. The perfect human structure of these two voices are surely the outcome of Flint’s mediumship. Of what can be learned from his autobiography «Voices in the dark», the direct voices that could be heard during his sessions were produced by a materialised ectoplasm larynx. This may account for the fact that these voices could be heard from one room into the other. As a conclusion for my study, I’ll report a short but meaningful event quoted from his autobiography that gives an idea of what has been said. «Once one of the mothers did not come in time for the session and after having waited for a few minutes, I decided to start without her. In a short while we heard the voice of a youngster who asked for his mother. Mrs. Barrett asked him what was the matter and we realised that it should be the son of the lady who had not come for the session. The lady explained to him that his mother had not come and that we had to start without her. «My mother’s train was late» said the voice, «but she is here now. She is sitting on a chair at the lounge outside this room. I beg you, please let me speak with her». With sorrow Mrs. Barrett told the boy that she could not open the door of the room where we stayed for his mother to come in because the light that would enter the room would harm the medium. «I ought to try to speak with her at any cost» said the youngster «she is so hurt by my death that she makes me unhappy and I cannot settle in my own new life». Then a wonderful thing happened.